New to Hit Drafts? Watch the video below for a full explanation on how they work. All participants are guaranteed The contents of ONE BOX. IF YOU ARENT ABLE TO MAKE IT TO DRAFT PLEASE CONTACT US BEFORE HAND AND WE WILL CHOOSE YOUR CARD FOR YOU. THIS IS ONE Case OF 2019 Topps Star Wars Authentics Autographs Hobby. EVERYONE WILL RECEIVE THE CONTENTS OF ONE BOX!!!! ANY EXTRA CARDS WILL BE PICKED IN REVERSE ORDER 12-1. 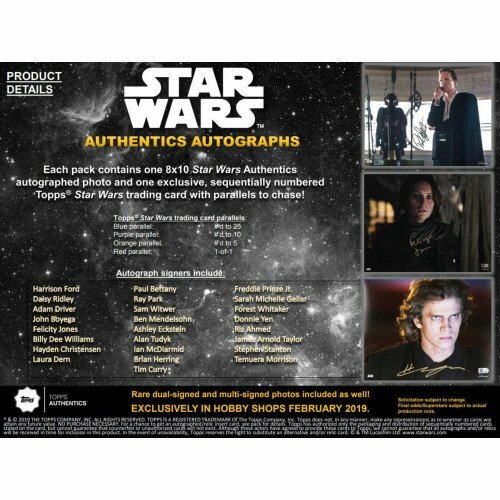 2019 Topps Star Wars Authentics Autographs Hobby 12-Box Case BOX DRAFT! 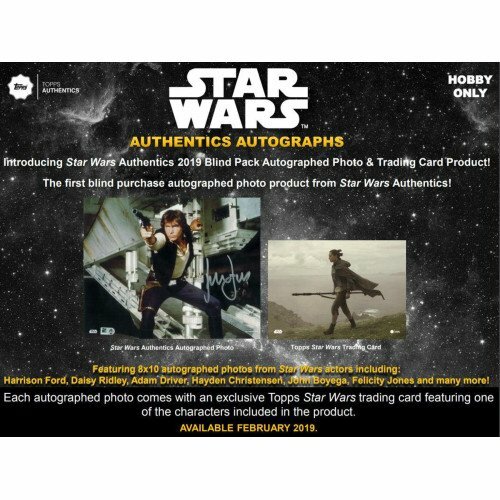 Each Box (Pack) contains One 8x10 Star Wars Authentics Autographed Photo and One Exclusive, sequentially numbered Topps Star Wars Trading Card!